Smart homes are becoming increasingly popular. Their infrastructure includes automatic control of electric light, air temperature inside, humidity level, etc. But all this is secondary if the system against water leakage is not installed. Perhaps you are familiar with the situation when a small break in the water supply system led to serious consequences. 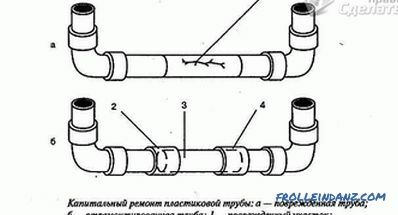 For example, an unreceived threaded connection, a rotten mixer or pipe poured into a huge bill, the amount of which included not only the cost of its own equipment, but also the repair of neighbors' housing from below. Local . Imply partial protection against flooding. Installed on appliances that can cause an unpleasant situation. For example, it may be a washing machine tray. It connects to the electrical part of the device. If the water begins to overflow, it will raise the float, which closes the contacts and puts the washing machine in emergency mode of liquid discharge. Supply hoses with an additional valve are also used for this role. When it breaks the water enters the protective chamber, where the closure of the contacts and activation of the locking mechanism. They can also be used for dishwashers and dryers. Scale . It includes three main components: the control unit, sensors and automatic locking mechanisms. The control unit is a central station that receives signals from sensors and, if necessary, activates valve drives. Cranes are not installed for any particular room (although this is also possible), but on the pipes of the central input. Therefore, the entire house is completely blocked. Signaling devices can be both wired and wireless. In the latter, the response time is much less, so the system works faster, and with them less electrical energy is consumed. They are installed in places that are at risk: under the washing machine, near the sink, near the bathroom or shower cubicle. 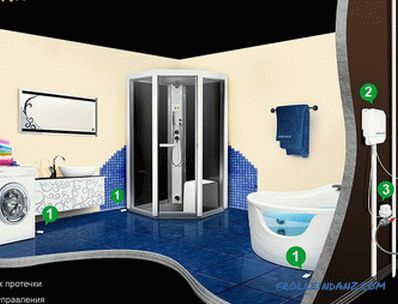 You do not have to worry that if splashes fall on them when bathing, you will remain in the foam, you usually need the liquid level to reach at least 1 mm over the entire area of ​​the sensor. Power supply of the whole mechanism can be either from the network, or from batteries or rechargeable batteries. An autonomous mechanism is preferable, since with the disappearance of electricity, this can be perceived as a signal, and the supply will be blocked. If it happened that you shed water on the floor and the sensors worked, then it is enough to take an ordinary hair dryer and dry the sensors well or use the forced opening key. In this case, the system will not respond to leakage within an hour. Today there are several companies on the market that have proven themselves in the production of security systems. It will be appropriate if you can make a comparison of the systems before they are purchased. Central base . It is a small chip, on which there are expansion connectors. 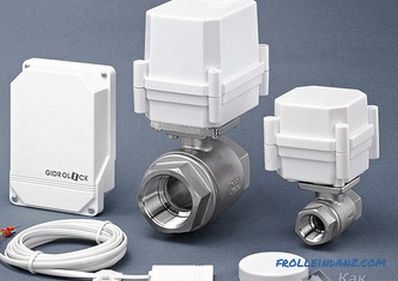 It supports the connection of both wired and wireless sensors, their total number can reach 20, that is, one can be placed near each place that is in the risk zone. Power is supplied both from the battery pack and from the network. The presence of 3 elements of standard C is provided. An additional kit can be installed, which will increase the autonomy of the entire system up to 5 years (for wireless sensors with a standard module, 1 year, with an additional one - 3). But even if the electric power is turned off and the batteries accumulated, the charge accumulated by the ionistors will be enough for more than 10 valve openings and closures. On the front panel are two large keys that are designed to control the locking mechanisms in manual mode. Also, a large number of LEDs are displayed that signal any breakdown or actions performed. Sensors . In this set, they are made very simply, but at the same time so securely that after installation you can forget about their existence, since they do not need maintenance. A small microcircuit is installed on the plastic stand, the contacts of which are coated with gold sputtering, so you can not even stutter about the corrosive effect. 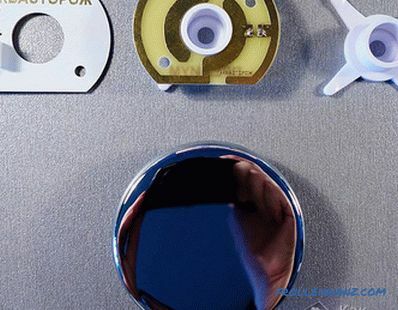 To give them a presentable look, from above they are covered with a beautiful stainless steel cap.The principle of their operation is reduced to the fact that when water gets in, the resistance drops and a signal is sent to the central panel. The cable can be extended up to 100 meters. Wireless sensors in their design have the same chip, but, moreover, in a plastic case there is a module for radio communication. Additionally, they can be located keys forcibly activating or deactivating protection. Ball valves . Special elements were developed with low resistance when turning the locking mechanism. It is very important not to spend a lot of time and energy on activation. Rotation is carried out using low-voltage electric motors. 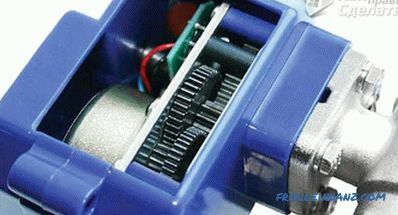 Due to the small metal gearbox, the rotational force transmission is transmitted. Every two weeks there is a test check in the automatic mode. This is done so that at the crucial moment the mechanism does not let you down, and if there are any flaws or something can be stuck, then it will be possible to identify it in the early stages. By the way, the control system is also provided in the valves. In the plastic block there are two microswitches that indicate the base in which position the valve is currently located. Installation of stop valves. It is carried out immediately after the water meter (in some areas it is allowed to do this in front of the meter). 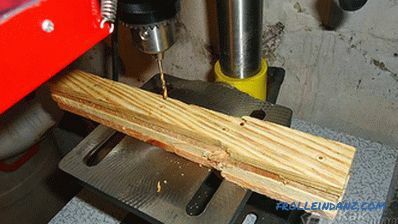 The joints must be sealed with tow or Teflon tape. Installing the controller. It can be placed in any convenient place. It is attached to the wall with a special bracket. Sensor distribution. They are stacked near any equipment in which water is supplied, as well as near water points. Combining all elements into one system. This is done with the help of wires or wireless technology. 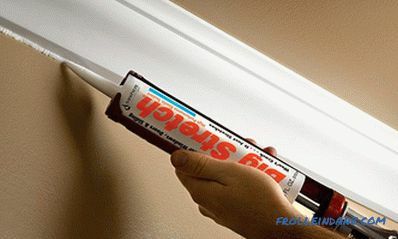 In the modification Expert available sensors with protection against breakage. In the usual configuration when the wire breaks the system is triggered. An additional capacitor is also built in here, and if the contact disappears, the central panel beeps that an error has occurred. The principle of operation of the Gidrolock system is in many ways similar to the previous one. It also consists of three main modules, but there are some differences. The central controller is much smaller and is located in a sealed plastic case. Front panel is not so interactive. There is one switch on the side face. 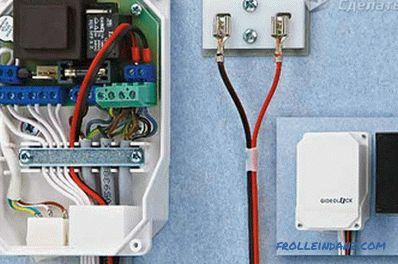 Power is supplied from the mains at 220 V. The microcircuit provides a unit for charging the battery, which is activated in the absence of the first source. Implemented support for 20 wired sensors. They are connected using terminals, rather than special connectors. Additional leads are available under the switch that can forcibly open and close taps. When triggered, a piercing beep sounds. Sensors . In addition to wired, sensors are also supported with signal transmission over the radio channel. To use them, you will need an additional module. It can go in a separate case or be installed inside the main unit. In order for the system to understand that it has wireless devices at its disposal, it is necessary to “train” it. To do this, close the two contacts that are listed in the instructions. After that, the sensor is moistened with water. A successful connection will be notified by a LED. Next is a test run. When a battery sits in the sensor, the controller notifies by a flickering green indicator. The number of flashes indicates the ordinal number of the device, which simplifies its identification. Cranes . They can be of different diameters, depending on the needs of the customer. 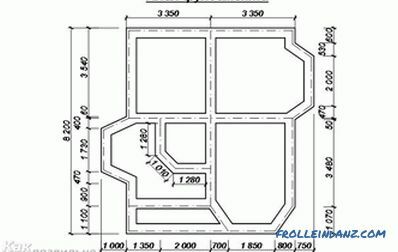 Stainless steel is chosen as the material for the case, it can serve for a long time. The servo drive is much larger than the previous system, which can be critical when installing in a confined space. 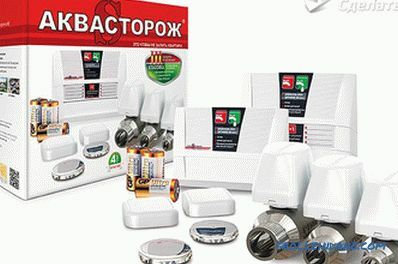 Installation is performed by the same method as in the case with Aquastorogem , but in addition it is necessary to take care of the electrical supply. Have to spend more time connecting all the sensors. Hydroloc also performs a test run, but it does this once a week. In this case, the locking mechanism in cranes performs a complete rotation around the axis, which allows one to get rid of coking, if it was formed. 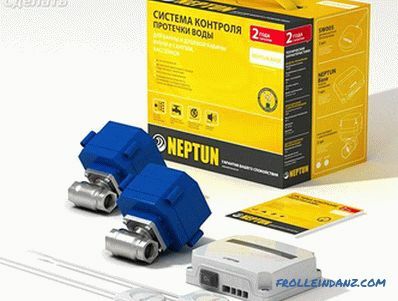 Neptun provides the user with a large selection of controllers.They can be wired and wireless. The implementation of the enclosure depends on the specific kit and installation conditions. There is an option for din-rail. This means that you can mount it directly in the electrical panel near the machine guns. In the role of powering elements can be battery packs, as well as a network of 220 V. The advantage of this system is the ability to manually control the valves. To do this, in some variations on the body of servo drives made special flags. Sensors can be mounted directly into the flooring, but they will need to be turned upward with the contacts. When triggered sound and light signal. 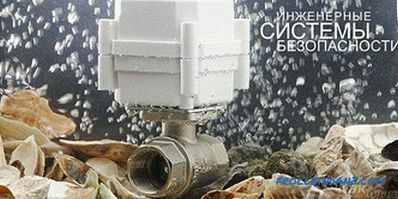 The time from the moment of signaling to the complete overlapping of water can vary from 5 to 20 seconds and it depends on which manufacturer's valves are used in a particular case. It is possible to interact with alarm systems, fire systems, as well as the smart home system. In the Neptune system, one of the most powerful servos on the valves. The torque at rotation can reach 16 Nm, this value is comparable with the force of a domestic screwdriver. Power is supplied only at the time of operation and only in the value of 12 V.
This option requires the least investment compared to all previous ones. 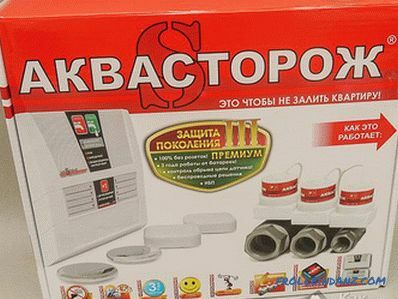 No need to connect the electrical system or any other batteries. The system is a mechanical device that is made of stainless steel. Inside there is a spring that holds the cone-shaped sleeve. As soon as the water flow exceeds the value of 13 liters per minute, the difference in pressure increases, which presses the sleeve to the protruding element, and the flow stops. Installation is very simple. 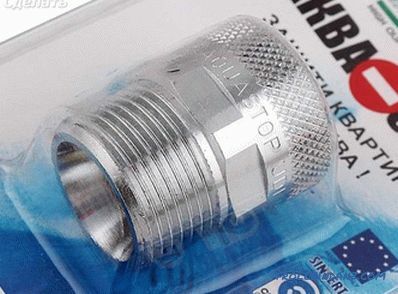 It is enough to mount this small pipe between the tap and the hose that fits the mixer or other appliance. So you need to do with each parsing point. All described ways to protect against leakage have proven to be reliable, able to cope with the tasks. What exactly to choose, will depend on your budget, the number of rooms, as well as the need to integrate with other elements of the smart home. With a skillful approach, you can implement an alert via SMS messages, which will always be aware of what is happening or interact remotely with the entire system.